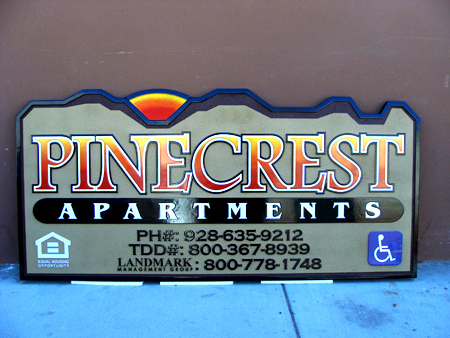 This beautiful Pinecrest apartment name sign features both raised and engraved text, raised borders and icons, and a carved mountain skyline and sunset scene. The colors are mostly warm (red, yellow, white), making an elegant and unique sign. The sign is clear-coated twice for additional UV and weather protection. This sign can be mounted between two posts, or hung from a wood or iron hanger, or placed on a monument base.